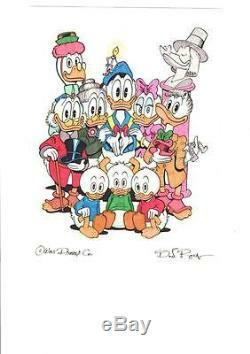 This original art drawing titled "Donald Duck & Family Portrait" was HAND DRAWN & HAND SIGNED by one of Disney's most famous artists and cartoonists, Don Rosa! Don Rosa HAND DREW 11 x Disney Ducks in this original art drawing! As many of you know, Don Rosa rarely draws more than 2 characters in his drawings so this rare item will be a unique addition to any Disney Duck/Rosa fan's collection. The condition of this drawing = Near Mint/Mint (9.5 To 10.0/10.0). The image area is flawless, clear, & bright. This original art drawing has no major visible flaws. 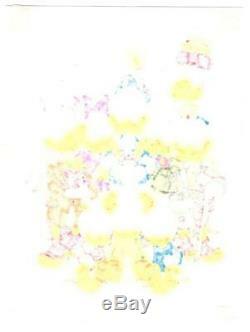 The dimensions of this original art drawing = 9.0" width x 12.0" height 22.5 cm. With an image area = 8.0" width x 10.75" height 20.0 cm. In addition, the length of Don Rosa's signature = 2.75 6.8 cm. Donald Duck & Family Portrait! Original Art Drawing Hand Drawn & Hand Signed By Don Rosa! DONALD DUCK & FAMILY PORTRAIT! Hand Drawn & Hand Signed Original Art Drawing. (1) Donald Duck & Family Portrait! Riginal Art Hand Drawn & Hand Signed By Don Rosa. Condition = Near Mint/Mint (9.5 to 10.0/10.0). This original art shows a family portrait of Donald Duck and his family! Don Rosa hand drew 11 x Disney Duck characters. (A) In the back row are: Gyro Gearloose & his little helper who is on Donald Duck's hat. 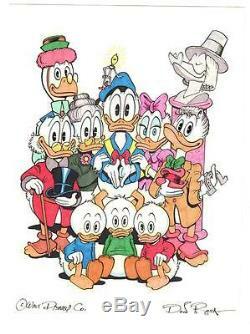 (B) In the middle row are: Uncle Scrooge, Grandma Duck, Donald Duck, Daisy Duck, & Gladstone Gander who is holding his lucky horseshoe. (C) In the front row are: Huey, Dewey, & Louie. (D) You will finally see a stone bust of Cornelius Coot, the founder of Duckburg. Characters and images in this drawing have been hand drawn and hand colored by Don Rosa! With high grade colored markers on thick, stiff, & high quality white-colored Bristol board. Don Rosa in black ink near the bottom right hand corner of the drawing. = 9.0" width x 12.0" height 22.5 cm. Image area = 8.0" width x 10.75" height 20.0 cm. Length of Don Rosa's signature = 2.75 6.8 cm. This also applies to our international buyers!!! We will respond to all emails within 24 hours. Create listings that get noticed! With Auctiva's 1,800+ Templates. The item "Disney Don Rosa Art Original HAND DRAWN & SIGNED Donald Duck & Scrooge Family" is in sale since Monday, November 07, 2016. This item is in the category "Collectibles\Comics\Original Comic Art\Drawings, Sketches". The seller is "qkick247" and is located in Ohio. This item can be shipped worldwide.